I ran into Walmart on my way home hoping to find the elusive and exclusive new Blueberrry Cheesecake, but what I found instead were *5* more flavors of Breyers reloaded and reworked OVERLOAD Line. Update: Saw -2- more flavors. Update #2: website is finally updates! That makes 16 BLASTS total! 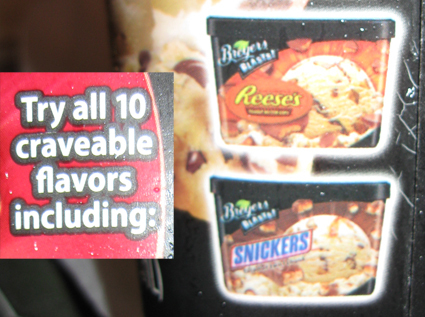 I feel a little silly for not noticing this earlier, but the side of the container specifically says there are 10 "craveable" flavors in all... wait, what, 10?? No no no, I specifically counted 11 flavors. Let's run through it. First, I spied 6 flavors at Shaws. At Walmart, I then see Reese's on the shelf and Snickers on the side of the container. That makes 8. There were a few more flavors at the end of the Walmart aisle including the mightily named Tin Roof Sundae and Double Milkshake. I hesitate when something is daringly named Double Milkshake because it really needs to deliver in my book. I think it was basically chocolate and vanilla swirled ice cream with chocolate chunks. My apologies for not snagging a picture, it's hard when the store is real busy. Now that makes 10, but wait, I've got one more for you! That's right, I picked up a container of S'mores! How am I suppose to resist a graham cracker swirl?? Well, I can't, not even a little. Now S'mores makes 11. Either Breyers can't count (which I find unlikely), or, well, I don't know why. Maybe somebody had a last minute stroke of genius and 10 begot 11. Update: I was at a different Walmart and I saw two more flavors!! Someone mentioned Whoppers, which I saw (and purchased), and I saw... BANANA SPLIT! Breyers has gone all out! That makes 13! 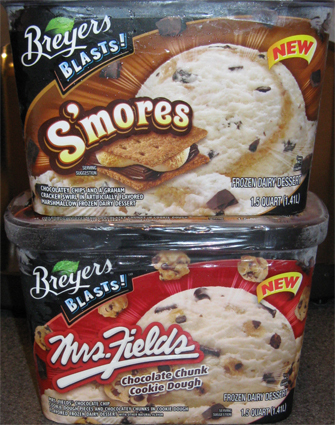 Update #2: Reader Nick noticed the Breyers site is finally updated! There are also vanilla and mint versions of the Oreo flavor (which makes sense), and Heath has survived the switch from OVERLOAD to BLASTS. That makes 16 in all! Now we will slowly but surely make our way through these new flavors this spring, so stay tuned. good call on picking up the s'mores. looking forward to a review, with MANY pics. S'mores has GOT to be delicious. I am headed to WalMart tomorrow and will look for these. Top 3 favorite flavors are cookie dough, reeses and s'mores...I just hope the "marshmallow" doesn't kill it. As long as it's swirled and not actual "puffs" like in Rocky Road, I think we're good! actually, it's marshmallow flavored "frozen dairy dessert", how's that for different? You have to try the Blasts Chips Ahoy! Perhaps the *10* doesn't include the flavors that already existed? I think you're missing a few - there is a Whoppers flavor and mint Oreo from what I can remember. well they just trademarked the BLASTS name back in Nov 2010, so these are all technically "new". I've never seen a whopper or mint oreo flavor (nor are they listed on their website). I want that wonderful Overload "fried ice cream" flavor back...Oh it was soooo good, and nothing can compare!!! I want to act like a little kid, go to the Breyer's main office and stomp my feet at them! "Bring it back, Bring it back!!" the waffle cone is AMAzinGG!!!! Have you seen these new Blasts? Let me know if you want pics. Yup, those are the new 2012 flavors (I need to adjust this post to mention that it was 2011 at the time). Thank you very much for the offer! @Mrteekellz23: correct, the chips ahoy version disappeared about a year ago.